Decorative Life: Approximately 7-14 days. Member of the Iridaceae (iris) family. This species is an interspecific hybrid and was originally from tropical Africa. 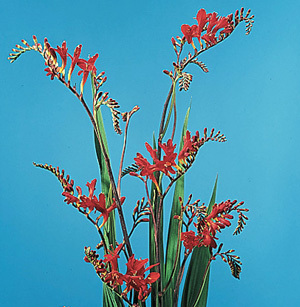 Common relatives include iris, freesia and gladiolus. Flowers funnel-shaped, 2 inches long, in two-ranked groups at stem ends. Stems leafless, branched, 3-4 feet long. Plant is a perennial from corms, classed as a monocotyledon, leaves mostly parallel veined. The “X” in the name means that it is a cross of different species. Specifically, this is a common hybrid between C. pottsii and C. aurea, blooming first in 1880 in France. Name is from the Greek for saffron smell created when dried flowers are placed in water. Flower abscission zones begin to form within three days of flower opening thus already setting the stage for the upcoming flower fall. Flower fall (abscission) generally occurs three days after flowering (anthesis) which is at flower (perianth) closure. Harvest when flowers are 50% open.